Posted on 06/17/2015 by Jeremy Bailey	in Around Town and tagged 2015 First-Year Player Draft, Atlanta Braves, baseball, Max Scherzer, MLB, Pittsburgh Pirates, Tampa Bay Rays, Washington Nationals. The Nationals have been in a rough patch the last couple weeks. They didn’t do much at home the first week of June, going 2-5, and then finished 4-4 on their latest road trip. They have fallen out of first place behind the lowly Mets. At 34-31, they are still in the thick of the race. This upcoming homestand is the perfect time to overtake the Mets. Again. On Wednesday, the Nationals send Jordan Zimmerman (5-4, 3.74 ERA) to the mound against the Rays’ Matt Andriese (1-1, 3.76 ERA). Thursday we’ll see Joe Ross (1-1, 3.46 ERA) finish off the two-game series against the Rays’ ace, Chris Archer (7-4, 2.00 ERA). You’ll have to wait until Friday, when the Nats play the Pirates, to see Max Scherzer (7-5, 1.93 ERA) continue his Cy Young campaign. Last week, Major League Baseball’s 2015 First-Year Player Draft was held. 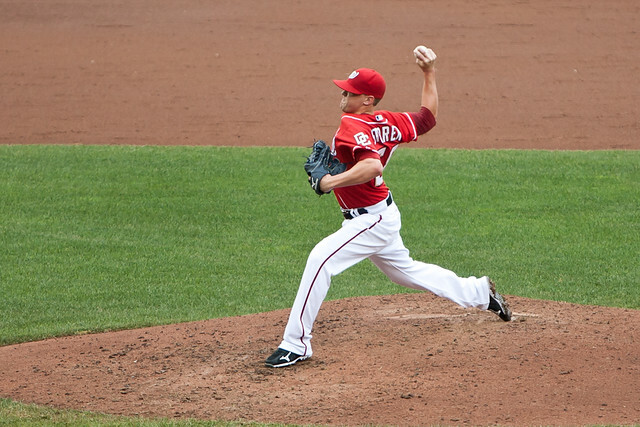 The Nationals selected the following players in the first 10 rounds, including Mariano Rivera’s son. Celebrate the Grand Opening of the new Team Store with special events on Wednesday before the game. The 9th Annual Ladies Night, featuring live music, player appearances, food samples and more. Even with quadrupling the number of available tickets from last year, 2015 Ladies Night is sold out. Fans can enjoy Ladies Night entertainment and music throughout the ballpark with a regular ticket. For more information, visit nationals.com/ladiesnight. The first 15,000 fans to enter Nationals Park through ALL GATES will receive a Nationals pilsner cup (ages 21 and over). The First Annual Senior Stroll. Fans 62 years old and over will enjoy a special discounted ticket that includes a concession credit and the opportunity to come down to the field after the game to stroll, walk or run the bases. For more information, visit nationals.com/seniorstroll. Nationals fans and their canine friends can enjoy the fourth of six games that make up the 2015 Pups in the Park series. All proceeds from dog tickets will benefit the Washington Humane Society. Fans and their pups will enjoy a designated Pup Zone in the Family Picnic Area featuring pet sitters and representatives from the Washington Humane Society and Fetch. Sunday’s event is sold out. Visit nationals.com/pups for future tickets. As part of the Nationals new initiative supporting youth baseball in the District, the team is providing two complimentary tickets to youth that play for a D.C. Little League team or D.C. Parks and Recreation Rookie League team. The first-ever College Rivalry Day at Nationals Park will celebrate the only remaining local ACC rivalry, between Virginia and Virginia Tech. Fans will receive a limited edition college-themed tailgate chair. For more information, visit nationals.com/collegerivalryday. The Nationals will honor each of the five service branches with their own patriotic themed-game during the 2015 season. Senior leaders and other representatives from the U.S. Army will participate in pregame ceremonies and will be honored as special guests for the Salute to Service.